I was banging my head for a few minutes because django-admin.py wouldn’t accept and wasn’t showing the “startproject” command. Well, it turns out that the “startproject” command is disabled when you have the DJANGO_SETTINGS_MODULE environment variable set. Zach did a ton of walking last night. I took a bunch of video but I need to import it into iMovie and edit it. 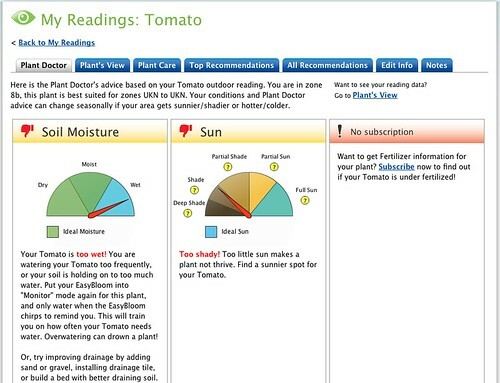 Here’s the first reading from the EasyBloom plant sensor for one of our tomato plants. The result was pretty consistent with what I was expecting. Our soil seems to be a pretty heavy clay and so it probably doesn’t drain very well. I’ve been trying to put a lot of organic matter in the soil to improve it. Recently I added a bag of Kellogg Amend soil (which has compost and gypsum) to the entire garden area, but it seems it’s going to take more time and/or effort to get the soil in optimal shape.